The return of Krakatau Reunion through Chapter One Concert has proven that music energy of its members never runs out. The presence of new album “Chapter One”, that was produced after its members separated for decades, demonstrates that Krakatau still exist in the world of Indonesian music. Performed with complete formation, Trie “Iie” Utami (vocalist), Dwiki Dharmawan (keyboard), Pra Budi Dharma (bass), Donny Suhendra (guitar), Gilang Ramadhan (drums), and Indra Lesmana (keyboard), Krakatau Reunion was successfully invited Keluarga Krakatau (the nickname for fans of Krakatau) to reminisce back to the era of 80s and 90s. After the launching of Chapter One album, their first concert has successfully made their fans to remember together at Grand City Surabaya on last Saturday (07/01/2017). This concert was also a compliance of Krakatau’s promise when they took part in Jazz Traffic Festival two years ago. "This appearance is our promise that we will release a concert and Surabaya is the first city because the city is very historic for us” said Trie Utami, the vocalist. On this concert, Krakatau Reunion brought twenty two songs from all their albums. They played "Kembali Satu” as an opening song and it was taken from "Kembali Satu” album released in 1989. Later, they displayed a song titled “Imaji” from their very first album “Gemilang” back in 1985. Meanwhile, they also performed some mainstay songs from their latest album “Chapter One” during the performance. Krakatau has also introduced the signature song from Chapter One titled “Aku, Kamu dan Kita“ to their fans. This song is the first composition after Krakatau reunites with reunion format. The Chapter One album was created in the middle of bustle activities of each personnel. Krakatau Reunion has been struggling with time to make a new album in 2015. Based in Bali, Krakatau has done trial and intense workshops to release this new album. On this album, they come up with several songs about life, friendship, and family. Chapter One album contains eleven new compositions which some of them have fusion taste and a characteristic as Krakatau Band is well known. For example, the song "Aku, Kamu, dan Kita” is very strong on the fusion pop and becomes first single as well as leading song in this album. Furthermore, “Mata Ke Mata” is a song about how each person has lied. "But frequently, we never realize that eyes cannot lie." Iie said. Next, "Cermin Hati” is one of the songs that created as an instrumental composition initially. However, Indra Lesmana gave some lyrics on it and finally this song was displayed with some difficult elevations notes. This also becomes one of characteristics in other Krakatau’s songs. In addition, "Hanya Bisa Melihat” tells about how current pseudo-life makes people forget and ungratefull for all the natural beauty of God. Viewers who averagely grew up in 80s to 90s era enjoyed the ambience much more when Krakatau brought some of their hits songs such as "La Samba The Prima Donna", "Imaji", "Di sekitar Kita”, “Kemelut” and several other famous ones. 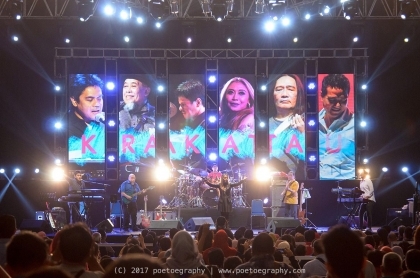 The performance of Krakatau Reunion on that night was truly a sign of band’s resurrection –which most people name it as a living legend band– since their first show in 2014 Java Jazz Festival. However, by the existence of Chapter One, the concert which was endorsed by Suara Surabaya Radio has become so different and special for Keluarga Krakatau in Surabaya.